– Move the lever up to the stop 2. – Release the lever again. The washer will stop and the wipers will keep running for approximately 4 seconds. The number of wipe cycles varies according to the length of time the lever is pulled. The rain sensor will only function in the intermittent wipe position. The intermittent wipe function is activated automatically when it starts to rain. To reduce the sensitivity level of the rain sensor move control, fig. 67 to the left. To increase the sensitivity level of the rain sensor move the control to the right. If you have selected a high sensitivity level for the rain sensor the windscreen wipers will react sooner to any moisture on the windscreen. The wiper intervals in the intermittent wipe setting are also varied automatically according to the road speed (in addition to the sensitivity setting). 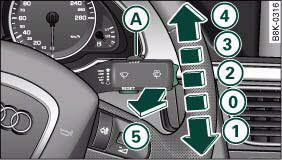 – Move the automatic wash and wipe lever to position 5, fig. 67. You can set the wipers to the service position on the sound system or MMI*. 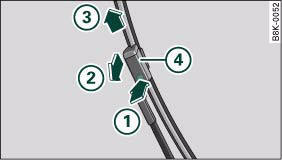 – If the wiper blades are not frozen to the windscreen, move the windscreen wiper lever to the "off" position, fig. 67. – Select: Function selector button CAR > Windscreen wipers > Service position ⇒ fig. 68. 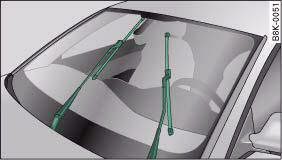 • on - the wiper blades can only be replaced when the wiper arms are in the service position ⇒ fig. 69. If you only work on the wipers when they are in the service position you will also avoid damaging the paintwork on the bonnet. – Press the release button 1 on the wiper blade ⇒ fig. 70. Hold the wiper blade firmly and press it forwards slightly 2.